U.S. astronaut Christina Koch, member of the main crew of the expedition to the International Space Station (ISS), speaks with her relatives through a safety glass prior the launch of Soyuz MS-12 space ship at the Russian leased Baikonur cosmodrome, Kazakhstan on March 14, 2019. Station astronaut Christina Koch will remain on board for about 11 months, until February – approaching but not quite breaking Scott Kelly’s 340-day U.S. record. Koch knew before launching last month that her flight might stretch into 2020 and sought advice from Kelly as well as retired astronaut Peggy Whitson, the current record-holder for female space flyers. 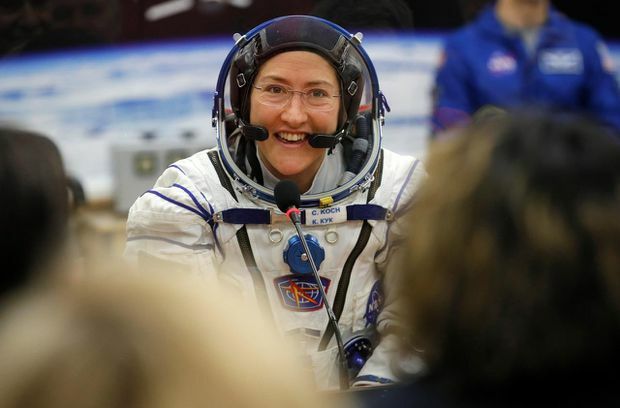 Koch will break Whitson’s 288-day record for the longest single space flight by a woman at the end of December. An electrical engineer who’s worked in Antarctica, Koch will undergo medical tests during her stay. More subjects and more diversity are needed, she noted, to better understand the effects of long-term space flight as NASA aims to return astronauts to the moon within five years. Another NASA astronaut also will have an extended stay. Dr. Andrew Morgan will launch to the space station this summer for a nine-month mission – also considerably longer than the usual six months. The physician and Army officer will lift off from Kazakhstan with an Italian and a Russian on July 20, the 50th anniversary of the first manned moon landing.